NEW YORK, NY — It was only fitting that South Carolina’s dagger to Florida was a dunk following a steal. P.J. Dozier swiped the ball from Chris Chiozza and it ended up in the hands of Duane Notice, who slammed the ball home with one hand and sent the Gamecock faithful into pandemonium. With 11 seconds left, it was all but official – South Carolina was heading to the Final Four for the first time in school history. “It doesn’t feel real. It feels like a dream. If it is, I don’t want to be woken up,” said Notice, who was wearing the net that the Gamecocks had cut down after their 77-70 East Regional Final win at Madison Square Garden on Sunday. Oh, it’s real, and it’s the surprise of this edition of March Madness. South Carolina had lost four of six entering the tournament. The Gamecocks beat 2-seeded Duke, 3-seeded Baylor and 4-seeded Florida in consecutive games to dance on to Arizona. And they used their calling card again. Trailing by seven to the Gators, who shot 7-for-12 (58%) from three in the first half to lead 40-33 at the break, the Gamecocks outscored UF 44-30 in the second stanza. The rally tied the Gamecocks’ largest comeback from a deficit at half this season – the other coming on Jan. 18 when the Gamecocks trailed 28-21 at the break but stormed back to beat these same Gators, 54-50, in Columbia. The Gamecocks were once again powered by Sindarius Thornwell, the East Regional Most Outstanding Player, who tallied 26 points to go along with seven rebounds. The SEC Player of the Year gave South Carolina a 65-63 lead with two free throws with 2:24 to play, an edge that Martin’s crew did not relinquish. 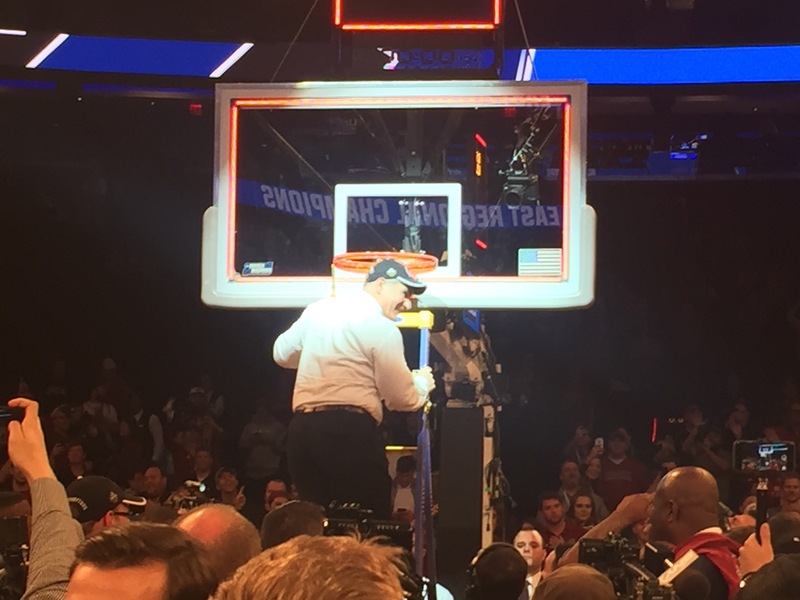 For Thornwell, a native of Lancaster, SC, this moment is extra special. After a steal by Thornwell with just over two minutes to go, freshman center Malik Kotsar made it a two-possession game with a 15-footer from the left elbow. It sent the over 20,000 at The Garden into a frenzy, as Mike White called time for the Gators. Florida answered with a Kevarrius Hayes lay-in, but Dozier was fouled on the ensuing possession, and he stepped up with a pair of clutch free throws to make it a 72-68 game with 50 seconds left. The main reason for the comeback to be complete? Florida’s hot start from the perimeter turned into an 0-for-14 performance from beyond the arc in the second half. The numbers surely don’t lie, and in a way, those stats and this game was a microcosm of the season for the Gamecocks. The fight through adversity starts and ends with the man at the top. Martin looks at back to a moment earlier this season when he told his team to take the rest of the season as a tug-of-war. The Gamecocks, and that rope, are going to Arizona, where 1-seed Gonzaga awaits.